Easter is the most important holiday on the Christian calendar. One of the beautiful things about the holiday is all the imagery wrapped up into it - themes associated with resurrection, rebirth, hope restored, death defeated, new life, restoration, healing, and victory. This is a wonderful topical pallet from which a songwriter can be inspired. In fact, there are many songs released each year with an Easter theme, yet only a very few connect with my heart at a deeper level. 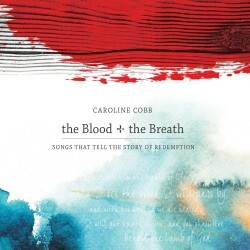 It's my privilege to share with you my personal favorite Easter song of 2014: "Wake Up" by Caroline Cobb. I wrote "Wake Up", a song based on 1 Corinthians 15, as a sort of "linchpin" song for The Blood + the Breath, an album that tells the story of redemption from scripture, from creation to the cross to Jesus' return. This song brings many of the themes from the album together, even as it is meant to point us forward. The idea for this song initially came when our pastor preached on this passage on Easter Sunday 2011. I remember him emphasizing that if Jesus had not risen from the dead, the Christian faith would be completely pathetic. If the resurrection didn't happen, if Jesus was still in the grave, it would be pathetic for us to "play church" and "follow the rules". But if He lives (and He does! ), if He is truly risen (and He is! ), then everything changes. We have a hope that can't be shaken. Death will die, sin will be abolished, Satan will be vanquished, and we will be changed. Every time I sing this song, I am personally challenged. Is this great hope of Jesus' return truly the great hope of my life? Is it the great hope of yours? If people looked at my life or yours, would they see us living for this hope? Or, would they see us putting our hope in vain idols like success, money, comfort, or approval? Does the resurrection and the promise of Christ's return infuse everything - the changing of a diaper, the 8 to 5 job - with meaning and mission and joy? Do we live as if I am listening for the trumpet sound? If not, we need to wake up! The song "Wake Up" will be featured on Under The Radar's 2014 Easter Radio Special - releasing on this site on 4/18/14, and airing on over 250 radio stations in over 15 international countries.